1968 Kaiser International Open Invitational, 1970 Canadian Open. Played in just 10 events, with best finish a T45 at the SAS Championship…First appearance came at Bruno’s Memorial Classic in May. 2002: Returned to action for the first time in nearly a year at the 3M Championship in August. Sidelined most of year due to complications from 2001 surgery on his left shoulder…Joined the ranks of the Georgia-Pacific Grand Champions at the Napa Valley Championship and T2 in the over-60 competition. Shot 6-under 66 in the opening round thanks to his second career ace on the Champions Tour. Holed a 4-iron shot from 196 yards on No. 7 of the South course at Silverado. Eventually T16 overall in the Napa event, his first top-20 finish on the Champions Tour since the 2000 Bank One Championship (T13). Made his first appearance the first week of July at the U.S. Senior Open after surgery. 2000: Battled Tom Jenkins down to the wire at the AT&T Canada Senior Open before falling one stroke short. Had tied Jenkins at 13-under par when he completed his final-round 66, but Jenkins, playing one group behind, birdied the final hole for the win. 1999: In the final round at Boone Valley GC, aced the 177-yard, par-3 third hole for the first hole-in-one of his Champions Tour career. 1998: Finished second to Jim Albus at the GTE Classic near Tampa. 1997: Second to Dave Stockton at Franklin Quest Championship in Utah. 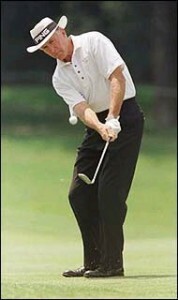 1996: Lost to John Bland in a three-way playoff at the Bruno’s Memorial Classic…Also was a runner-up at the season-ending Energizer SENIOR TOUR Championship at Myrtle Beach and earned a career-best $160,000 paycheck…Carded one of three double-eagles on the Champions Tour during the second round of the Boone Valley Classic. 1994: Claimed his first TOUR win in more than 24 years when he captured The Transamerica. Defeated Isao Aoki on the first hole of a sudden-death playoff. Victory came at Silverado CC near Napa, CA, the same venue where he claimed his first PGA TOUR win in 1968…Lost in overtime to Lee Trevino at the Royal Caribbean Classic. 1993: Fired a career-low and year-best round of 10-under 62 at the Desert Inn on the opening day of the Las Vegas Senior Classic. 1991: Made his Champions Tour debut at the Raley’s Senior Gold Rush and finished T15 at Rancho Murieta CC…Had not played in any PGA TOUR event since 1987, with 1982 being his last full year on the circuit. Co-founded the PGA TOUR Bible Study group in 1965…In the period between the PGA TOUR and Champions Tour, he authored three books on religion and world affairs: The Gospel, The Gospels Interwoven and Palestine is Coming…Has his own Web site: kermitzarley.com…Received an honorary doctorate in the spring of 2001 from North Park University.